Only the "Famous Five" of Paul, Sandy, Jackie, Peter and myself met in Peebles on 11th Nov, for our annual "Ken Maskell" ride in beautiful Borders country. We had a bright, dry day , but very cold to start with! The Glenholm tearoom was sadly closed, but luckily I remembered the Laurelbank Tearoom in the village of Broughton, which was only a similar detour! -but well worth it!! We arrived at 10am prompt as it opened! I revived my frozen fingers and toes with tea and a bacon roll, while everyone else warmed up with scones and tea/coffee. We set off again about 11am, just as the village Remembrance Day ceremony started. On uphill, with a brief pause at the poor old Crook Inn, and the hope that the money required to save it was "nearly there" but had to be got by end of 2012. On through Tweedsmuir and past the reservoirs, and my usual "walk" up the ultra steep 1mile, and then a relaxed long run down to St Mary's Loch. We stopped for our picnic lunches, then on to the Gordon Arms for coffee/beer - recently re-opened and in the process of doing up their accommodation. For any cyclists down that way, The Gordon Arms is a welcoming hostelry and deserves our support, - as will hopefully the Crook Inn! 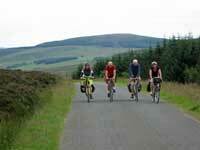 Then uphill to the Traquair junction, and along through Cardrona back to Peebles before dark. Thanks to all who turned up. See you next year! This annual ride traditionally marks the end of British Summer Time although it was a week early this year. It also upholds the tradition that CTC stands for Café to Café rather than Cyclists’ Touring Club, as is sometimes thought. The route offers six opportunities for café stops but we were restrained and stopped at only three. Mind you, that is still barely an hour of cycling per café! The ride has something of a soggy history and was called off last year because the forecast alarmed so many participants. The numbers weren’t any better this year until a day or two before the ride, when things suddenly improved. Eleven people turned up on the day and for once the organiser’s promises came true: we were treated to autumn mists (fog at the start in Aberfoyle), mellow fruitfulness (lengthy breaks at cafés with tempting cakes) and – yes! – sunshine. Alec, Clare S, Clare C, Deb, Eibhlin, Jill, John, Keith, Lynn, Pat and Tiana assembled in the Wool Centre café at Aberfoyle. Welcome to Jill and Clare S, on their first outing with Mellow Velo. We split into three groups for the Duke’s Pass. 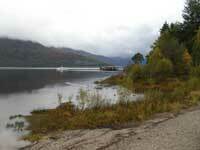 One stayed on the public roads and arrived first at the café by Loch Katrine. Another group took the forest track and turned up about half an hour later. The third group climbed on the road and descended on the forest track, taking another half hour, so the roadies had enough time in the café for three lunches! A light shower of rain as we left Aberfoyle did not last long and the sun came out when we reached the summit of the pass. The autumn views were glorious, with the yellows of beech, birch and larch set off by the darker bracken. Who needs to go to Perthshire? We stayed together for the ride around Loch Katrine on the private road and stopped for a group photograph at the viewpoint. 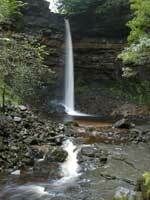 The numerous waterfalls were in spate after the recent rain and some distance markers have appeared on the bridges. There’s an off-road diversion that avoids the steepest gradients but most of us went up the hill anyway! 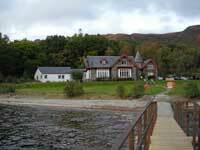 The café at Stronachlachar was open and has been extended in recent years with a conservatory. We sat outside in sunshine instead of the usual rain and tested the tea and cakes. The pecan shortbread was recommended. A steepish climb led to the B road, after which it was generally downhill for the rest of the ride. Some of the worst bits of road have been resurfaced and the longest freewheel is now beautifully smooth. Unfortunately there was more traffic than I recall, including several coaches. Lochs Chon and Ard were picturesque in the afternoon sun. We were strong-willed enough not to stop at the Wee Blether and rode all the way back to Aberfoyle without further refreshments. A glorious ride. Thanks to the drivers who offered lifts, without which this ride could not take place. Let’s hope for even better conditions next year! For the last weekend ride of the year, six of us travelled in pairs on separate trains (max. 2 bikes per train) to Stirling station bound for Rowardennan Youth Hostel by Loch Lomond. We left Stirling in dull drizzly weather by going over Castle Hill and down the other side. This rather odd way avoided a lot of busy junctions and connected with a signed cycle route out to the west of the city through Raploch. At the motorway interchange all the slip roads are to the south of the A84, but there is a good footpath on the north side, so we passed it without crossing any roads - brilliant. An old bridge (closed to motor traffic) over the Forth led us to Drip Moss, very wet, partly flooded, including part of the road which we crossed without anyone falling in. At Gargunnock I hoped to get coffee at the pub, but it was closed, so we took the Old Military Road all the way to Kippen. I had scouted the eastern bit - rough, potholed and puddly, but firm, so all cyclable with care - and I expected the western half to be much the same. It wasn't: it soon became a green lane, into a steep dip, across a field of cattle and through a wood. It all had a good stone base below, so was not muddy, but a lot of it needed to be walked. The sight of a car at the end of the wood gave us hope that the rest was going to be tarmac: it was, and we sailed down into Kippen for an early lunch. We then took the B822 which climbs to a ridge with views of the Fintry and Campsie hills to the south and to the Highlands in the north, but on that day the Highlands were rather blurred. Then along the "Old Roman Road" (single track, with gravel down the middle) to Balfron, where a well-stocked Co-op provided vegetables and other fare for the hostel meal. After Balfron Station (the station and line disappeared decades ago) we had to go along two miles of A-road: I had tried it on a weekday and it didn't seem too bad, but on a Saturday it was very busy, and I was glad to get off it at Drymen. By then the sun was out, and we sat outside the Pottery Cafe with tea and cakes. At Balmaha we had our first sight of Loch Lomond, the low sun reflecting off the water to produce an almost black-and-white image of the loch and its islands. Finally, a frustratingly switchback road to Rowardennan, with some short but very steep inclines that we walked up, but compensated with views of the loch at sunset and autumn colours in the woodland. We reached the hostel just before the daylight started to fade. On Sunday, John joined us at Balmaha. Its pub was - unexpectedly - open on Sunday morning, at least for coffee and scones, which we took by an open fire. Then we went by Drymen and Gartness to Killearn where we had lunch at a craft shop/cafe opposite a disused church being converted into a village hall. From Killearn we went through more autumn-coloured woodland to Fintry, where John left us, and then past the Loup of Fintry (a spectacular waterfall) to Carron Reservoir, situated on the watershed so it has a dam at each end. At the Carronbridge Hotel, Sheelagh and Laura went on ahead to catch an early train from Larbert (which has only one train an hour on Sundays), and the others had tea and cakes in front of another open fire. 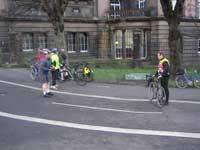 Then a fast downhill to Dunipace and by a pretty and very minor road to Larbert. Dorothy and Barbara stayed at Larbert to catch a train from there, but Tiana and I went on to Falkirk High, successfully navigating the streets of Stenhousemuir and Falkirk. We had to queue to buy tickets and got on the platform as the train was coming in. Total distance: about eighty miles, no more than four being on A-roads. For most of the time the weather was dull with periods of light rain, but rarely heavy enough to be unpleasant. Despite that and the problems with trains home, everyone agreed that it was a wonderful weekend. Seven of us (Alec, Anna, Barbara, Jenny, Keith, Richard and Tiana) met up at Penrith Station on a sunny but breezy morning. The day’s route was predominately the NCN71. First port of call was the Millyard Café at Morland where we tucked into delicious scones. The first event of the day occurred at the ford near Kings Meaburn where one person decided that it was easier to cycle through rather than take the bridge. The inevitable happened. Fortunately, other than being soaking wet, she was unharmed. Unfortunately no-one had their camera out at the time! Next stop was Appleby where we were meant to meet up with Pat and Eibhlin. However they had already set off and (they claimed) had gone to Morland, back to Appleby and were now near Kirkby Stephen! They need to come more often to learn how to slow down! Falling off the front, as it were, is your own problem, so those who had forgotten food bought a piece and we set off to the Rutter Falls for a picnic. Next stop was Kirkby Stephen for a cuppa before tackling the long hill to Tanhill. The views were grand, all the hills free of cloud and most of us stopped at intervals to admire them. The staff at Tanhill were unfazed by a group which appeared over a couple of hours, the ‘leader’ bringing up the rear, and we eventually all gathered for a pleasant evening meal washed down with local beer. Sunday's forecast was not good. 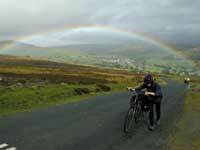 We set off for Reeth where we met up with Richard and then tackled Redmire moor in the strengthening wind. Most of us walked and admired the lovely rainbow to the North. We piled into the Bolton Arms for lunch. Alec had a slow puncture and wisely decided to change the tube here, for we had hardly got going again when the rain started. It wasn’t heavy but the wind blew it through our waterproofs and we arrived dripping wet at the Green Dragon at Hardraw. To view Hardraw Force you have to go through the pub - a good wheeze for not only do they get extra custom but they charge £2 to see the waterfall! 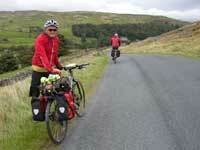 We stayed until we could make a beeline for the Hostel in Hawes. Monday saw us set off in different directions. Jenny, Eibhlin, Pat and Keith set off for Kirkby Stephen where Jenny caught the train, Eibhlin and Pat cycled to Appleby and Keith to Penrith. The remaining four went to Denthead where Anna peeled off to get the train – and met up with Jenny further down the line. Alec, Barbara and Tiana visited the station at Ribblehead and admired the viaduct. Then set off for Ingleton for a late lunch and to pick up the original planned route to Settle. Parkinson’s law dictated that we miss the earlier train so the views were a bit dim to say the least. All in all we had a good time and will return again. Thanks to Keith for being a volunteer back marker. 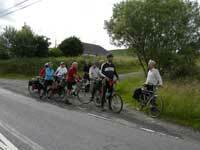 Jan, Caroline, John, Peter, Ross and Shona met in Kirriemuir for this ride. Jan had announced a 1030 start but in true MV tradition it was 1130 by the time that we left after coffee and discussions of how many aubergines and bottles of wine to carry for dinner. We set off westward and stopped to eat at Peel Farm, near the Loch of Lintrathen and next to a smart new school. After lunch we turned northward for the climb up Druim Dearg and met a woman with a folding bike provided at low cost by the NHS to encourage exercise. The gears were far too high and she had to walk up the hill but was enjoying herself. The descent gave a glorious view of Glen Isla. At Brewlands Bridge we turned west and found an unexpected Bothy Bakehouse at Lower Whitehouse, just before Blacklunans. Naturally we stopped for tea and scones and to inspect the bothies, which were arched structures that could sleep five in a row - like tents but warmer. We took the minor road on the east of Glen Isla and passed Freuchies, where an extraordinary round house was formerly a SYH. Many road verges had profuse harebells and thistles, very pretty, and we found some tasty raspberries. It was now about 1730 due to all the the stops and we still had 15 hilly miles to go so we took the cycling a bit more seriously. The minor road up the west of Glen Prosen has several gradient arrows on the map and we were glad to reach the Prosen hostel. This was private, although listed by the SYHA, and more comfortable in every respect than Broadmeadows on the last trip. We had a room for six to ourselves with wooden bunks, wider and more solid than the SYHA provides. The kitchen had the usual facilities and we cooked ratatouille with brown rice, followed by rhubarb crumble. The TV in the lounge was showing the finals of the Olympic diving, almost the last day of competition. In the morning we took the less hilly road on the east of the glen past a memorial to Scott and Wilson of the Antarctic. 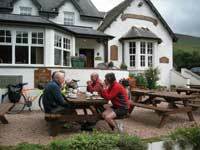 Suggestions of coffee at Dykehead were overruled and we rode up the west side of Glen Clova. The views were magnificant. Coffee was finally taken at the Glen Clova Hotel where we had about a minute of sunshine, which ended as soon as people started to rummage for sunscreen. 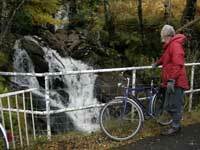 We continued up the glen to the visitor centre at Glen Doll, site of another former SYH. Returning south we took the easily graded road on the east of the glen and ate lunch at a picnic area by the bridge where the roads rejoined. At Dykehead we found that the hotel was closed for renovation, with no signs of activity. No refreshments! A few more miles brought us back to Kirriemuir. Distance about 48 + 39 = 87 miles. The scenery had been glorious and we were lucky not to need waterproofs for the whole weekend. Let's hope for sunshine as well next time. 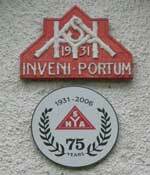 A trip to see this historic hostel (the first in Scotland, which celebrated 75 years in 2006), but which is under threat of closure at the end of this season – probably our last chance for a visit! A good crowd of 11 cyclists assembled at the Commonwealth Pool at 10am on a sunny, breezy Saturday to start the ride from Edinburgh to Broadmeadows. As there's no place to stop (for coffee or lunch) between Dalkeith (too near home) and Innerleithen, 30 miles away, we chose a fairly direct route to Dalkeith (and beyond) instead of the round-the-houses NCN Route 1. The old A7 via Gilmerton and past Dobbies was actually not too busy, and has protection with either cycle lanes or shared pavement for much of the way. Just before Eskbank we discovered that by opening a barrier and crossing some waste ground we gained a short-cut to the railway path; and a little further on we met up with Ross, at just about the appointed time of 11am. We were making good progress! Anna revived us all with slices of lovely fresh cool melon at this point. There followed a short and hairy passage on the A7 up to the Carrington turn, and we re-joined the A7 later (much quieter by now) for a couple of miles so as to avoid a devious and very hilly bit of NCN1. Leaving it onto a very small road up to Middleton, the climbing started in earnest, and continued to the summit of the road known as The Granites, which crosses the Moorfoots. We stopped here to admire the views backwards across the city, the coast, and, in the other direction, the Pentlands. A descent from here to Garvald Lodge, then another, gentler climb to a summit followed by the descent of Glentress alongside the lovely Leithen Water, through a golf course, to reach Innerleithen in very respectable time, just after 1pm. Would you believe it, they had laid on their Gala for us, the whole town bedecked in ribbon, band marching down the street, and all the folk dressed up in their best finery. Luckily there was still room in the Whistle Stop Cafe, where we partook of lunch. After crossing the Tweed, there began the long climb through Traquair and up to the summit at 'Paddy's Slacks' (don't ask! 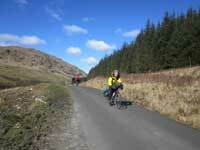 ), then a descent to the Gordon Arms at the junction of B709 and the Yarrow Valley road, A708. This pub has had a chequered history recently but seems in good shape at the moment. The Yarrow is a lovely valley, with a historic kirk halfway down at Yarrow. Reaching Yarrowford, below the hostel, I suggested we should use the footpath access rather than the official track. This was a disaster, as the path got increasingly narrow, steep and muddy. The Manager however welcomed us with open arms and open bike shed, into which we crammed the 12 bikes. 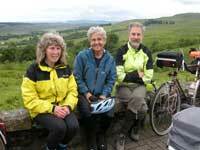 Shortly after, our 13th cyclist, Jan, arrived, and the two walkers, Sue and Sheena, who had come over from Innerleithen. The hostel's kitchen and dining area have been refurbished, and by arranging the tables into a square all 15 of us got round it. The starter of mackerel pate, hummus and pitta bread was provided by Sheena. Main course, a vege Indonesian curry, was directed by Tiana; and dessert of rhubarb and apple crumble and custard had been made in bits by Peter and was re-assembled. Peter assured us the main ingredients were organic, but was reluctant to disclose location of the apple tree – some suspected it was a neighbour's garden – surely not! In good MV tradition the wine, red and white, flowed freely, and happily, the SYHA now turns a blind eye on such activities. Despite kitchen improvements, the same old hostel iron bedsteads, with their lumpy mattresses, were still there, but after 50 miles on the road, with sun and wind, most of us didn't even notice. For breakfast we had John's home-made bread, three different varieties. The weather held for us the following day for our return to Edinburgh by a different route. We followed the valleys of Yarrow, Ettrick Water and Tweed to Yair Bridge, at which point Ross went off to explore a back route on the south side of the Tweed while the rest of us took the road on the north side via Caddonfoot (meeting us again at Peel, he reported the route was OK, if a bit cobbly). From Peel we took the back road (south side) to Innerleithen – a lovely road, wooded, very quiet – and stopped at the same cafe for coffee and/or lunch (a bit early for lunch, 11.15). We recalled that John still had his bread, so with some cheese from the Co-op we carried on, through Peebles, to Lyne Station and then the turning up the Meldons. 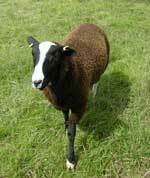 At the junction was the most amazing flock of sheep, brown, very curly hair, but with black faces set off by a white stripe down the nose. We found a picnic table further up, but couldn't get out of the wind, which was strengthening all the time. Luckily it was blowing in our direction! 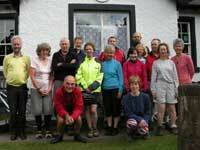 Ross, our 'scout', who had taken off at Peebles to explore a route on the south side of the river, rejoined us here. The toilets were closed (blamed on 'anti-social' activities) so we continued through Eddleston, and used an old quarry off the main road as an impromptu loo stop! It was a relief to leave this road (no pun!) for the minor road via Gladhouse; the Reservoir very choppy with the wind. The roads have been re-surfaced, and the steep descent, beyond the Reservoir, with tailwind, was an exhilarating experience – we just had time to feel sorry for 2 cyclists going the opposite way! A lot more downhill took us through Temple and Carrington to Cockpen, then it was a re-run of the route out, and back to the city just after 5pm, having covered 57 miles. As leader, I was very happy we'd all kept going so well – and, dare I say it (! ), less of the faffing for which MV is renowned! Well done everyone! In total, an enjoyable weekend with seven of us meeting up on the Friday evening, we were in the company of Ross Henry who was stopping over on his way home from Tongue, where he had sunshine. After a short familiarisation on suspension and hydraulic discs – a new experience in rapid deceleration for Jenny and Paul we seven, Emma, Melanie, Jenny, Paul, Simon plus Cathie and myself, did the main 28 mile route, Cairngorm Lodge Hostel, Coylumbridge, Loch Garten Osprey reserve, Nethy Bridge, Ryvoan and back to the Hostel on Saturday to the encouraging intermittent accompaniment of Simon’s delightful classical refrains. These changed tune slightly at one point when he found his front brake to be non-functioning, otherwise they lifted our spirits if not the rain clouds as we cycled through a gentle Northerly breeze with intermittent rain which varied from drizzle to light - rarely off and never heavy but never far away - even closer on too many occasions were the midges. Saturday night saw us enjoy a shared meal of chilli followed by Eton mess and a surfeit of drink was enjoyed by all. That evening we also got a lesson in German humour – yes there is such a thing, for details see the full narrative (in the yahoo group files section). Emma and Simon left early on Sunday due to other commitments leaving five to do a short run in weather which was drier and brighter than Saturday’s but which had seen us breakfast watching a torrential downpour. The start was delayed by a puncture problem in my rear tyre, which I only found when reflating the tyre I had softened part way round on Saturday to get some traction, after puncturing 3 tubes with no sign of the offending article I gave up and hired a bike from Glenmore. 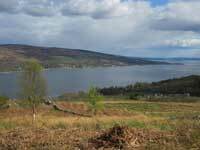 The route was mainly forest track via Loch an Eilein to Inshriach Nursery coffee shop for wildlife watching and returning much the same way for lunch at Glenmore Shop/café before dispersing for home. Distances cycled were 28 miles Saturday and 20 miles for Sunday – so far as statistics go, suffice to say Saturday was leisurely and I do not have figures for Sunday which I think are largely academic on runs like these, the pleasure comes from the terrain, scenery and wildlife. I think everyone enjoyed themselves – I certainly hope so and I fully intend to do it again next year possibly looking to reduce the time on public highway and explore more extensive use of forest paths, particularly on Saturday, also with a slightly easier climbing option which I still need to recce myself. I am very glad to have seen so many enjoyable new things and to have taken the time and a little trouble to organise it!!!! Anna, Barbara and Tiana took the direct train from Edinburgh to Milngavie, where five minutes of pedalling up the first hill of the day took them to John's house for coffee and cakes. Refreshed, the four of us set off into the rain that was to be the main feature of the day. The route was through Mugdock and Strathblane to Killearn, where we spied a soggy village fete and a sign advertising 'Scottish hospitality' underneath a dripping tree. We left main roads behind and cut through Gartness to pick up the Sustrans route NCN7 into Drymen, where the pottery cafe provided a good lunch. 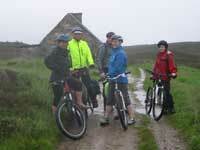 It was a long climb up NCN7 to the north and the scenery looked bleak in the dreich conditions. 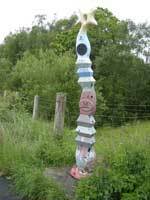 The millennium milepost at Cobleland had been painted in a gay pattern, including a floral border on its base. 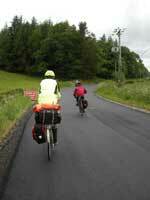 Another couple of miles and we were in Aberfoyle, where the strong-willed team declined the cafes and pedalled on. Forestry tracks were not attractive in the wet so we followed the road over the Duke's Pass and around Loch Achray; not surprisingly, there wasn't a lot of traffic. The rain got steadily harder and we were glad to escape from it when we reached the Brig o'Turk tearoom. The refreshments weren't bad either and Barbara had a discussion with the staff on possible additions to the gluten-free menu. 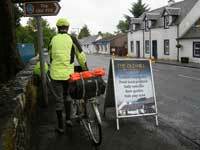 The midgies were well aware that tasty treats inside the tearoom meant tasty victims for them outside so we set off hurriedly into the rain again, passing the former hostel at Lendrick. 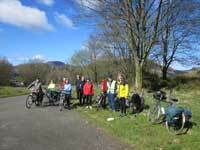 Just before Kilmahog we met NCN7 again and followed it to Callander for provisions. A few more miles back along NCN7 took us to the Stank Burn. John had done his recce in winter when the trees were bare and the Glasgow CTC hut was a lot harder to find this time! We were soon inside, out of the rain at last. The hut was cosy with plenty of room for the four of us but would have been a squeeze if filled to its capacity of eight. It has electricity and mains drainage but not a mains water supply; water had to be boiled or filtered. No showers! We dined off baked potatoes, guacamole, tuna and salad, followed by cherries, which had cost less than £2.50 from the reduced food in the supermarket. The wine (half price) cost twice as much. The hut cost only £7.50 per person so this may have been the most frugal MV trip in years. By morning the water had stopped falling from the sky but it had also stopped coming out of the taps in the hut so we had to dip buckets in the burn. This wasn't fit for drinking so we couldn't fill our bottles before leaving and had to stop at a cafe in Callander to do this. Of course we had to buy coffee in return. We had done only five miles - was this the shortest ride before coffee in MV history? The route led through Thornhill to Kippen, where signs warned us that the road was closed. Nobody could tell us whether the road was totally closed or not so we continued and found it was the ideal sort of closure for resurfacing: the road was still closed to cars so we had the beautiful new tarmac to ourselves. A lengthy climb and descent took us to Fintry for lunch. 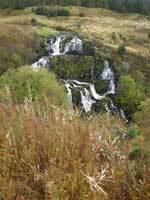 This prepared us for the major climb of the day, the Crow Road over the Campsie Fells. Unusually, we were helped by a gentle following breeze. A stream of cyclists were taking part in an event for bike week; luckily they were going in the opposite direction so we did not embarrass them with our hill- climbing speed! After savouring the view over Clachan of Campsie we descended into Lennoxtown and Torrance before taking undulating back roads to Baldernock and back to John's house for tea. Thankfully it was downhill back to the station and the train to Edinburgh. About 44 + 38 miles total. A pity about the weather, which kept us off the scenic tracks that had been planned, including one through a field of friendly cows. The CTC hut could be used for other routes in future, perhaps ending in Balloch or Stirling, and there are plenty more cafes to sample! We were blessed with one of the few good weather weekends this summer. Starting from Berwick station we headed out to the south of the Tweed in glorious sunshine for some early morning refreshments at Paxton House tea room. Then across the Union Bridge into England and on to Norham castle, as painted by Turner and still looking impregnable. We stopped for a good look round the castle and then cycled on to Norham itself for a picnic lunch in the village square. By this time we were well behind schedule and had not actually cycled very far at all. But we intrepidly pressed on to Etal with a stop to see the miniature railway and then to Branxton for a brief tour of the concrete menagerie. We spent some time inspecting the smallest tourist information centre in the world, to be found in a phone box dedicated to the forthcoming 500th anniversary of the battle of Flodden. By now it was getting late and we were at maximum distance from our overnight stop. Disillusioned with the weekend chiefie’s route planning abilities, 2 of the party (who shall be nameless) abandoned ship and set back to Berwick via the Border’s cycle ride route. The rest of the party took the recommended route back through Ford and the quiet side roads of north Berwickshire. The hapless chiefie was struck down with a puncture, but other members of the group had the presence of mind to reschedule the evening meal and we all sat down at 8.00 pm for a meal at the Malting’s Kitchen who coped manfully with our diverse dietary requirements. On Sunday, the haar had descended and we took the coast route out to Lindisfarne avoiding cows and cliff tops and making an eerie crossing along the causeway in the mist. The chiefie wants it to be known that he had checked the tide tables but it did not give advice on mist. St Cuthbert did manage to deliver the sun around midday and after looking round Holy Isle we returned back for another gentle ride through Berwickshire in the sun to be rewarded with amazing cakes (for those who stayed loyal to the chiefie’s navigation) back in Berwick. This was not a ride for those who wanted to add big distances to their cycle computer odometers or to achieve “grande boucle” average speeds, but an enjoyable sojourn along quiet back routes and delightful countryside whose major event was well almost 500 years ago. Thanks to all who came. A weather forecast of sun for the Saturday, and more wind and rain for the Sunday, triggered a last minute change of plan, as suggested by Tiana. We altered our route to an anti-clockwise circuit, starting at Gourock/Dunoon to Portavadie (48 mls in the sun), and Kyles of Bute to Rothesay on the Sunday (30 mls in the predicted rain!). We travelled by train Edinburgh to Gourock, and sailed to Dunoon on the small Argyll Ferries boat –foot passengers and bikes only. Then set off from Dunoon at 10.45, round the Holy Loch and on to the Ben More Botanic Gardens Tearoom for our first cuppa! Then some easy cycling along Loch Eck in sunshine, to Strachur by Loch Fyne for lunch at the Bay Cottage Tearoom, where we encountered more hungry cyclists! Then by beautiful Loch Fyne to Otter Ferry, and a cuppa outside The Oystercatcher, before tackling the big hill up out of Otter Ferry! Despite the hills, we enjoyed some nice evening sunshine and a more sheltered road, and at long last I heard my first 2012 cuckoo!! Then some welcome downhill to our turnoff to Portavadie, where the road proved to be more up and down than I’d recollected! We arrived at the new Portavadie Marina at 7pm to a friendly welcome from The Lodge staff, and were impressed with the facilities –comfortable dining area and soft sofas by a log fire, and a modern en suite “bed and locker room”, (£22 pppn with continental breakfast). 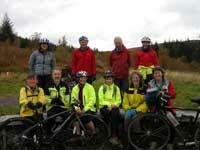 Another group of 6 lady cyclists who had come from Ardrossan were also guests. Sunday morning started dry and windy, but the forecast rain soon arrived!! 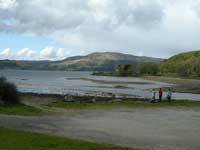 After Tighnabruaich, there were more challenging hills to the Kyles viewpoint, then down and round Loch Riddon, and on to the welcoming haven of the Colintraive Hotel for delicious soup, apple and cinnamon cake, teas and coffees –and dried off a little by their fire! 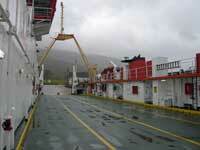 We caught the 2pm ferry to Rhubodach and battled on towards Rothesay and (much to my surprise!) made the 3.10 ferry to Wemyss Bay! The train was already in so we relaxed for the rail journey home, after an energetic weekend with mixed weather, good company, and as usual unsurpassed scenery! Thanks to the Fab 4 - Tiana, Jan, Barbara and me!! From all corners of southern Scotland we met as planned for coffee in Helensburgh. There were 11 for the weekend plus 3 day riders. Most of us came from Edinburgh, testing out the excellent half-hourly direct train service via Bathgate/Aidrie and Glasgow Low Level. Thanks to those who went on an early train to ensure we all got on. The bikes (5 on one train) did not appear to be a problem – ticket collector friendly. The train journey was very pleasant. Some people spied The Waverley paddle steamer at SECC. We set off via Rhu, Garelochhead and Rosneath Bay round the peninsula – four people taking the short extra above the coast road: Balfour Road. Lunch, booked at Café at Kilcreggan, (16 miles done) on the waterfront (where the Gourock ferry comes in), offered an excellent menu. In good sunshine, we proceeded north alongside Loch Long (B833). 8 people decided to visit Linn Gardens, a unique natural garden, by all accounts. Stopping to enjoy views south, almost to Arran, the rest rode on to Coulport. Climbing through Garelochhead Forest and north to Whistlefield roundabout, we took the B872 to descend into Garelochhead. The others arrived later – having turned east earlier, near Peaton House. Sunday dawned bright and we were soon off, climbing back to Whistlefield roundabout and on north (A814) above Loch Long, planning to take Glen Douglas east. After about 4 miles, at the jetty, we decided to take the MOD road (tarmac) through the forest as the gate was open. This proved a stroke of genius, saving us a steep climb, and we were soon in sunny Glen Douglas (descending for 5 miles) with brilliant views of snow on The Cobbler and other peaks. After photos and snacks we continued to Inverbeg and Loch Lomond. The off-road track began on the pavement but soon it was separate from the road, a good surface and not too noisy. Lunch in the sunshine at Luss Visitor Centre was a delight followed by a look round the village (of TV fame), especially the church. 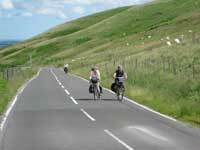 Continuing south, we were heading for the beautiful Glen Fruin. 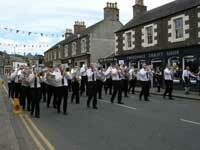 Most of us took the B832, soon turning right at a crossroads for Highfields and almost to West Kilbride. One person took the A817 new road through Glen Fruin. Others continued on the B832 to Helensburgh and home. 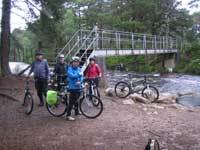 Those heading for West Kilbride, crossed the Fruin Water at a small bridge and climbed to Drumfad, then right to Helensburgh. 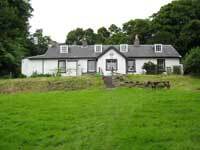 Some people visited Hill House in Helensburgh (Rennie Mackintosh/NTS) and others visited Geilston Gardens in Cardross. We were a very cheery group. The four newcomers to Mellowvelo have all said they were delighted with the welcome, the routes, etc. Long may it continue. On a clear and sunny day a whole six of us met at Middle Meadow Walk, the photo shows Geoff returning the compliment of having his photo taken by an interested amateur photographer who collects photos of bike groups, runs or unusual bikes. We had an uneventful run down to Musselburgh in fine sunshine checked at the station for other potential members – found none, then continued to Oldcraighall then round through Dalkeith Park to admire the folly summerhouse and Celandines on the verge, point out the café, when open, to Simon to whom this was new territory and continued up the Penicuik trail to Bonnyrigg and then to Cockpen. From here we were on roads albeit very quiet ones through farmland past Rosewell admiring the gorse in the hedgerows as we went and through Rosslynlee Hospital where our only mechanical, a puncture in the inside of a rear tube caused by a misaligned rim tape happened. At this point as in one or two roadside stops some of us were only too glad to get into shade – so strong was the sun. At this point Simon made his escape via Auchendinny as he needed to be home early. The remaining five continued into Penicuik via Kirkhill and the last section of path for lunch at Craigiebeild as planned at around 13.15. A very pleasant lunch was had before setting off for home the short way, straight down the A701 where I got a “nice bike” comment on the Mercian from someone who had been around this earth less years than the Mercian. The telling thing was he didn’t know they did refurbishment work, at least he knew what it was which I would reckon unusual for someone of that age. “Thank You” seemed the appropriate answer before we went our separate ways. Monday morning and the heat in my face and arms told me that sunscreen would have been a useful thing to carry and use the day before – who would have thought it.